I couldn’t find the example of really dirty hands. Maybe some day I will make that video myself. 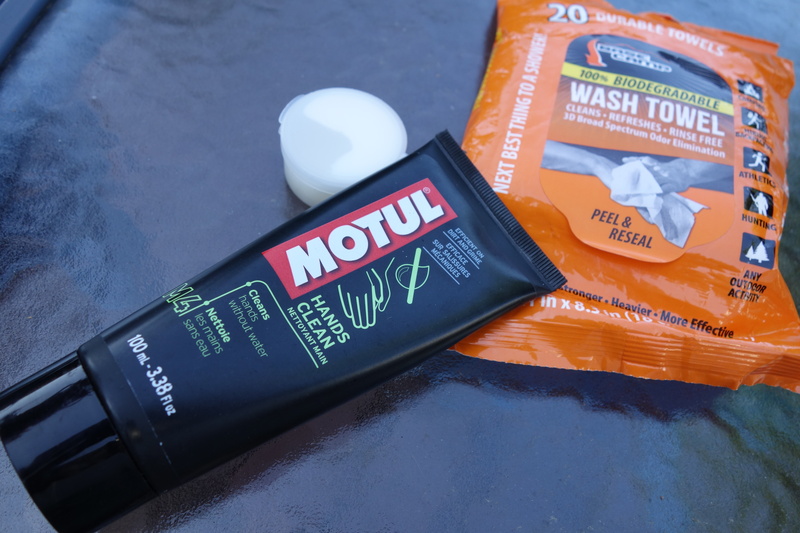 Anyway, the real advantage of Motul hand cleaner is that it is truly waterless. You don’t have to rinse your hand with water. You don’t even have to wipe it off with paper towel. You don’t have to carry the whole tube. You can move it to smaller (sealable) container. 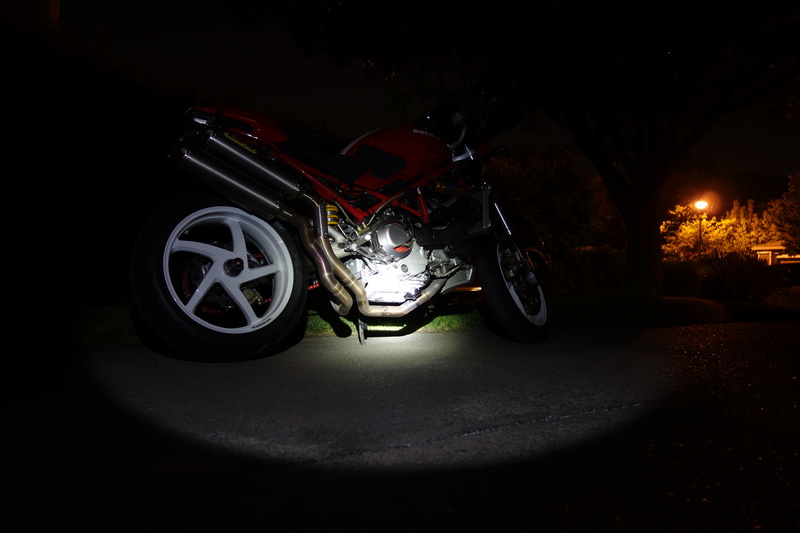 So, here’s the realistic guide of flashlight for the motorcyclist. 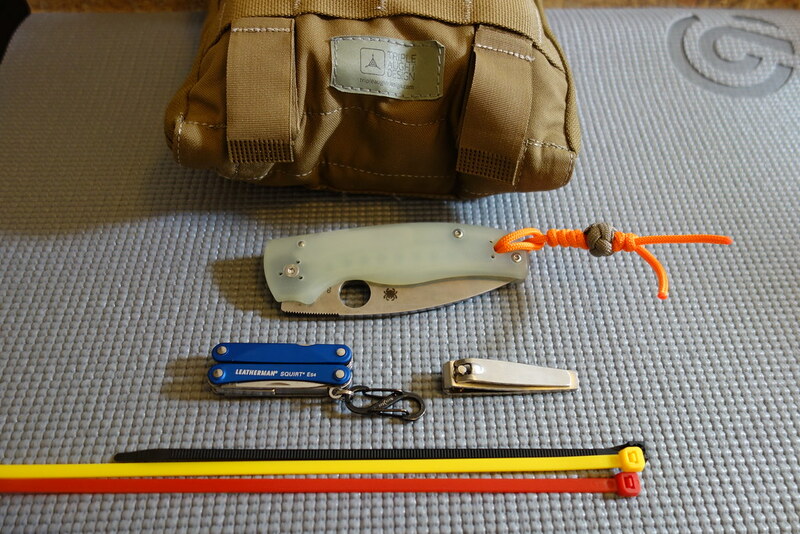 I quickly gathered what I have around here that are affordable AND usable, functional as either EDC flashlight or part of the motorcycle tool / travel kit. 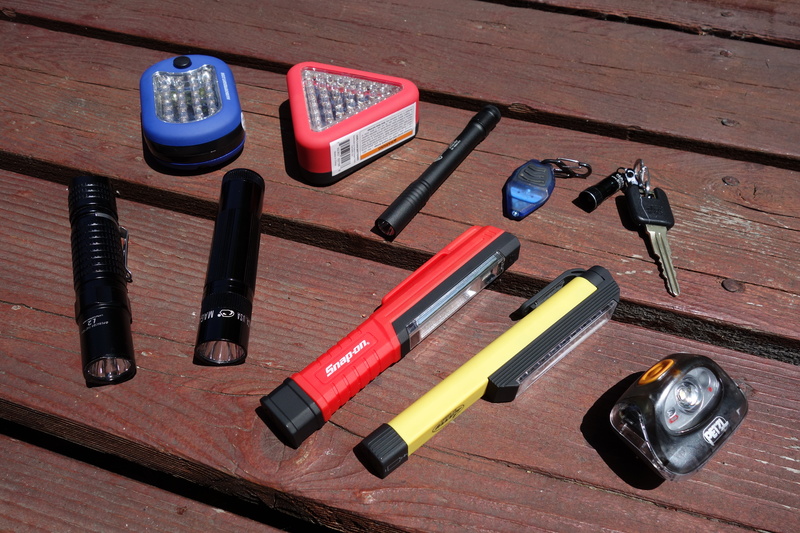 Pretty much all of them work, as EDC light, or Motorcycle tool / travel kit light. Don’t bother about lumen rating, not only that factory claimed lumen rating is overly optimistic and unrealistic, but also that the brightness isn’t everything. 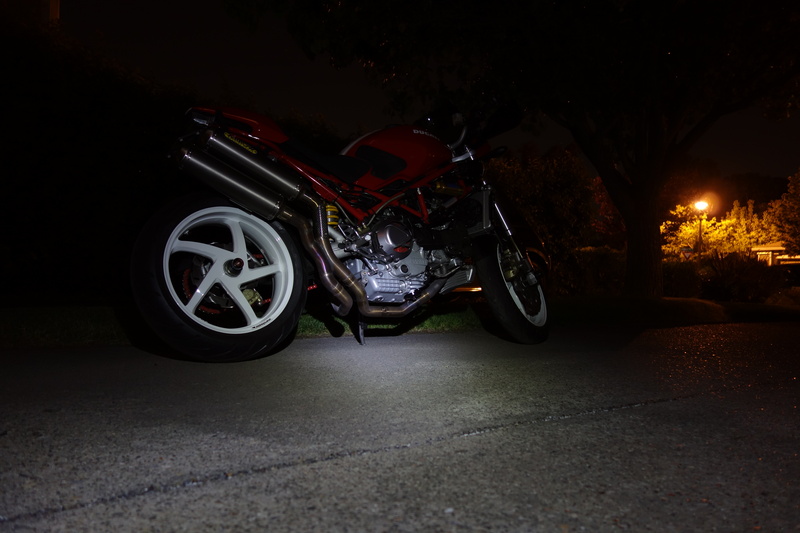 Some work better than the others as a work light, despite the low(er) light output. When you are doing the emergency repair on the roadside, you don’t have to throw the beam 200 yard away. Narrow beam with bright hot spot in the center isn’t good for this kind of situation. Petzl Zipka is still my favorite. You can use both of your hands, which is very important. 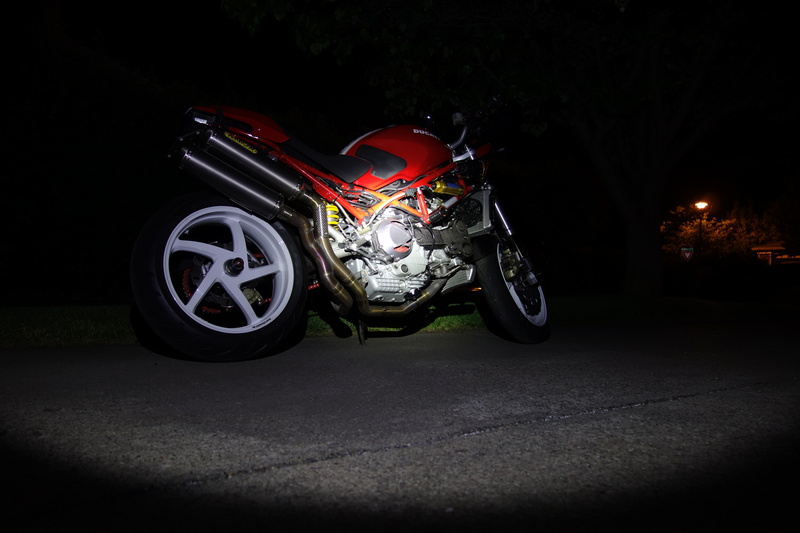 The best performer AS A WORK LIGHT is Snap On COB light. Click on the beam shot picture for larger image, and compare it to Maglite XL50, for example. You will notice how Snap On has nice defused light and the entire foreground is lit up, whereas XL50 has bright hot spot on the center (which is too harsh to the eyes so you will have to aim the light slightly off from the subject). You can see Petzl and Snap On are the only two that illuminate the entire foreground. Harbor Freight Cheapie and Larry are close second. Considering the price, these two are good value. 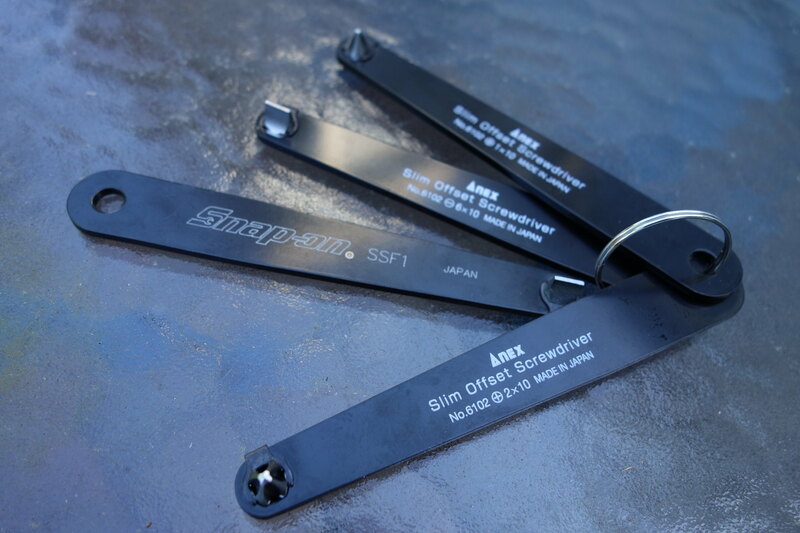 Also, Snap On, Larry, HF have magnet on the back, have either pocket clip or hook, so they can be used as hands free. Nano and INOVA STS are actually pretty useful, as long as you understand their limitation. (close quarter range only). Highly regarded Stylus Pro isn’t all that great, to be brutally honest. 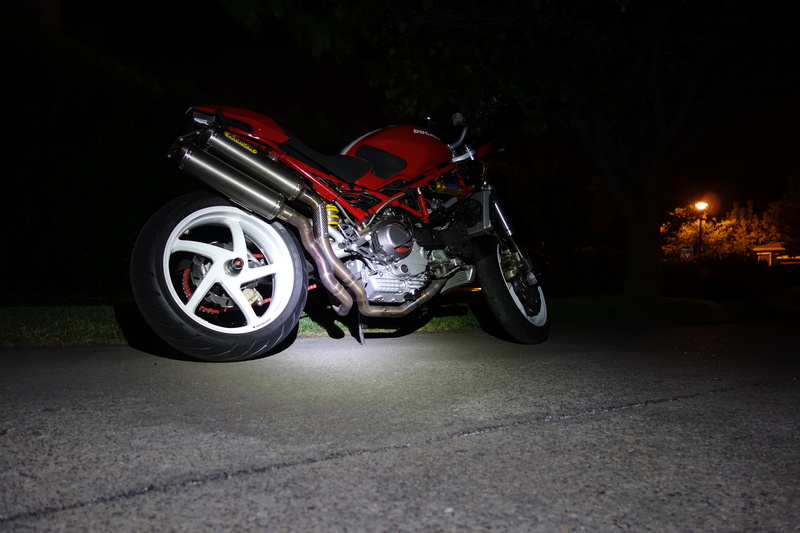 Harbor Freight and Larry LED work light work better. LAPG L2 is far better flashlight with not so much difference in the cost. LAPG L2 is a tactical flash light. It’s the brightest and the longest light casting flashlight in this group. If I have to help someone to find a lost wedding ring in the pitch black parking lot at 2:00AM, this is what I would take. I have the blue harbor freight light -- about 4 of them in my house and one in each of the cars. They have a very good magnetic back which sticks nicely to the inside of the hood or trunk and a fold-out hook if you want to hang it from something. 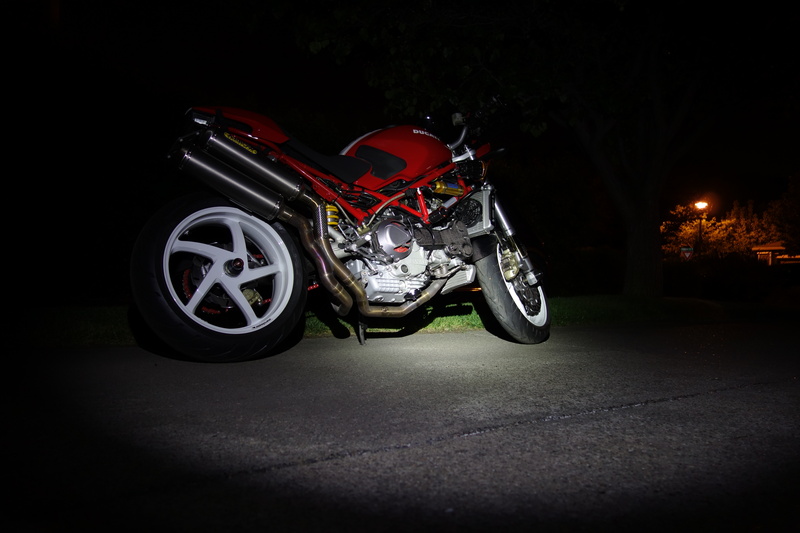 They also have a side flashlight mode, so you can use it as a flood or a hand flashlight. Often free with coupon if you get their catalog. Every time I see the coupon i drop in and get one. Not necessarily an emergency tool, but nice to have, cool stuff. 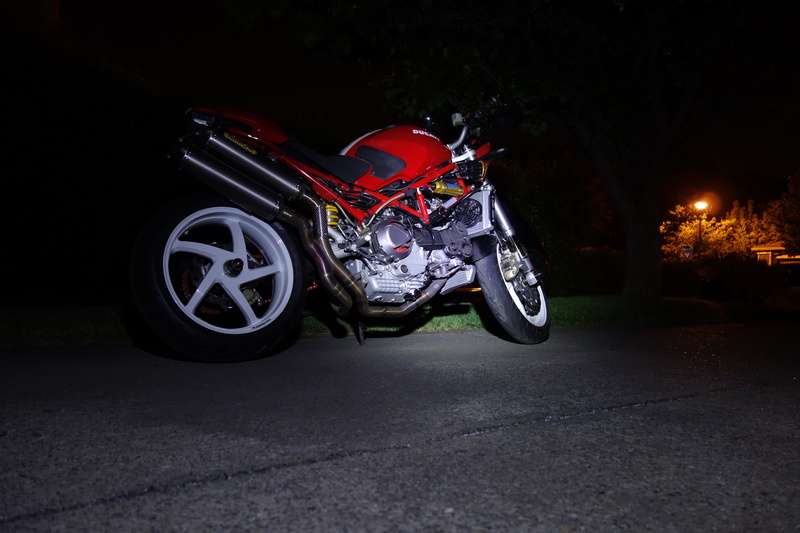 One of the Ducati Monster’s annoying little problems is that you can’t adjust the front fork rebound damping unless you undo the handle bar clamp bolts and move the handle bar out of the way. 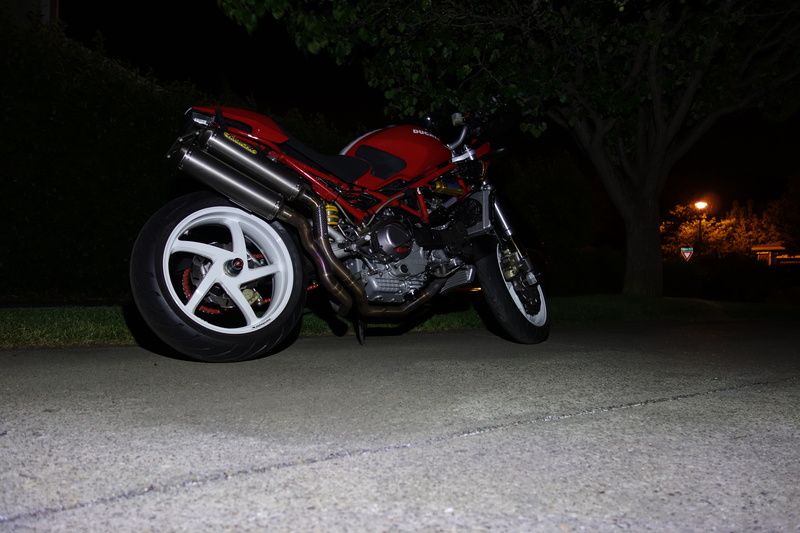 Anyhow, this is the only screwdriver that can fit in between front fork cap and the handle bar on the Monster. 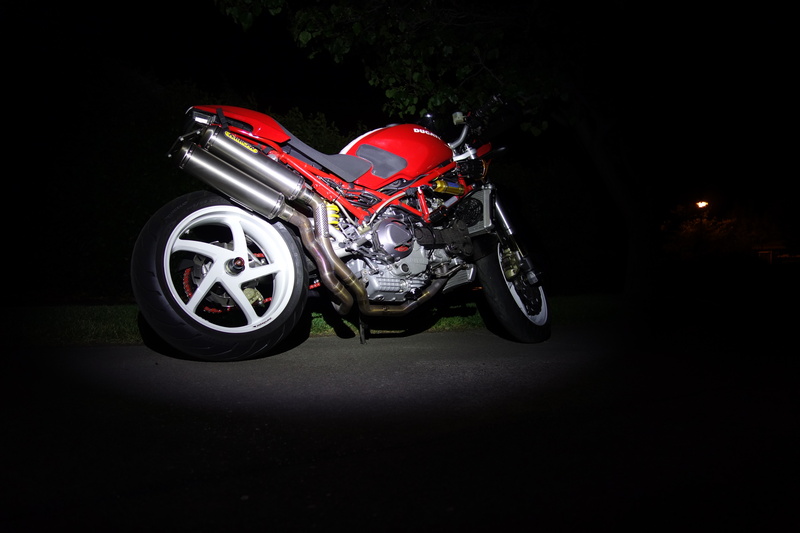 Nice, but those screwdriver bits are a little too tall for the real tight spot, such as Monster's front fork rebound damping adjuster. 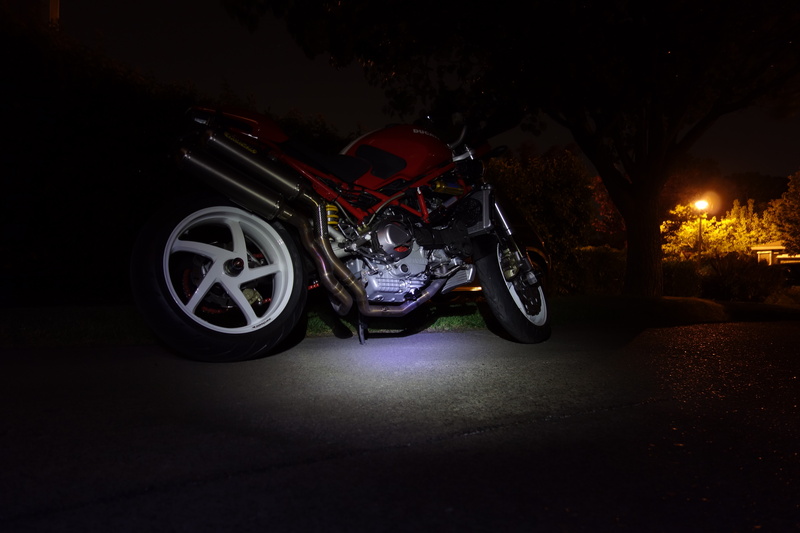 BTW, for those who are interested in COB pocket work light, I would recommend to check out EZ red version. If you are not interested in how the cheap compressor fails in an emergency situation, skip to 9:06. 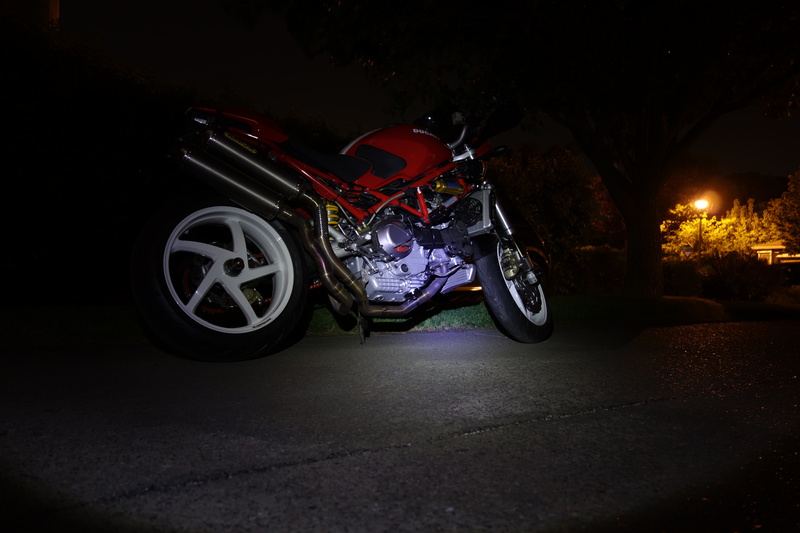 When you are out there on a motorcycle, what kind / type of cutting tasks you’d encounter? 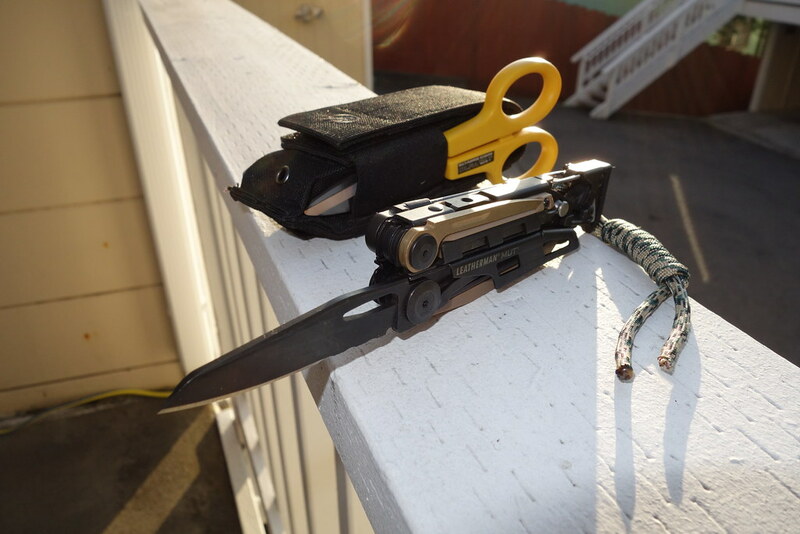 to carry a utility knife than carrying $200 + folder alone. 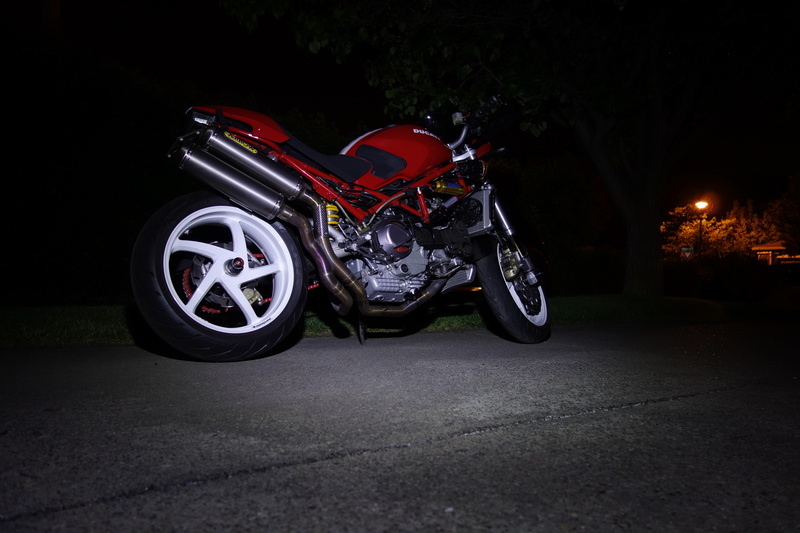 (If your idea of “motorcycling” always involves hunting & fishing, camping, that’s a whole different story. And, quite frankly, scissors are more useful and safer, than using the knife, more than 50% of the time when you need to cut something. 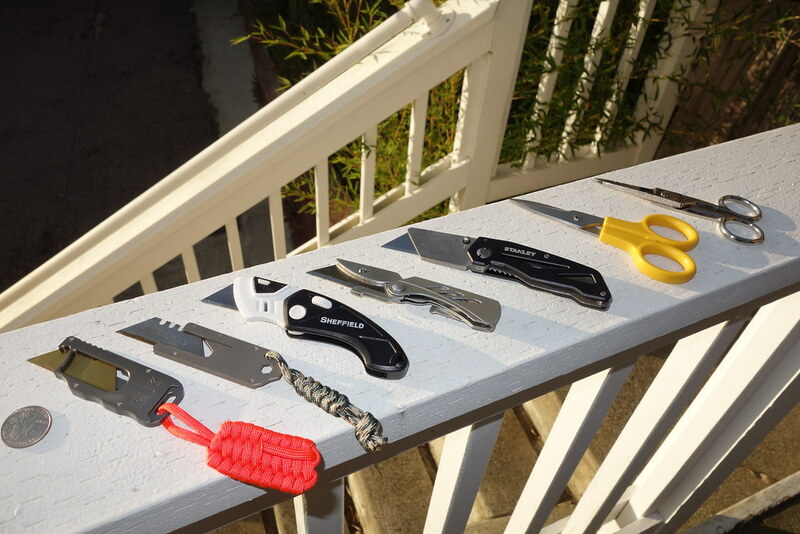 As for the utility knives I showed here, only two of them are worth owning. I ALWAYS have either one of them in my pocket. 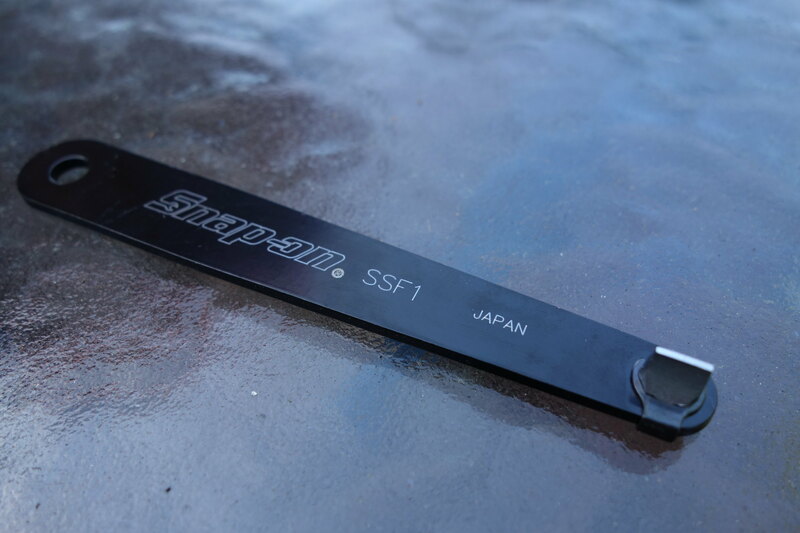 #1 It is great to have some cutting tool you can use without worrying about damaging the blade. In a mild case of vehicle (or other kind of ) emergency, there are times that you have to cut something on the metal, or, you have to worry blade potentially hitting the hard object while performing the cutting task. 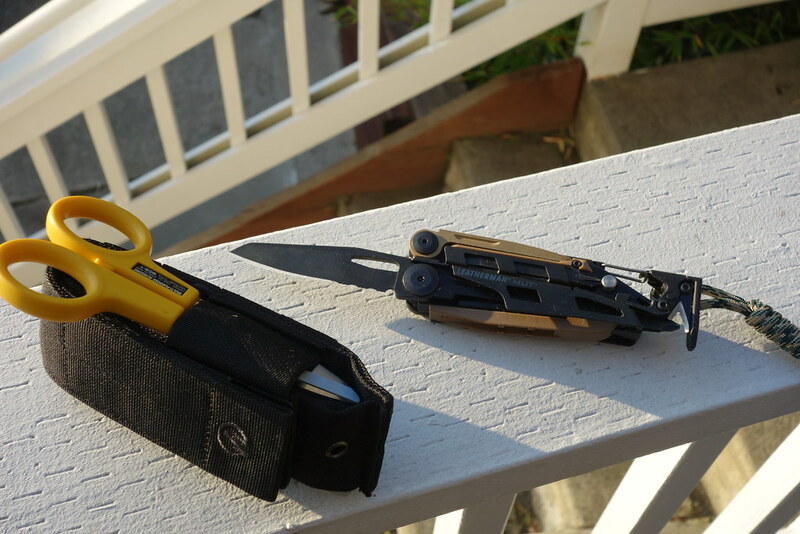 #2 When you have to use the knife in the public, those pocket sized utility knives are visually far less threatening, it won’t upset some people who can only think anything sharp and pointy = weapon. You can pretty much forget about Sheffield and Gerber. They are not worth buying. Despite the 4.6 star rating on Amazon customer review on Gerber EAB, I would say this is one of the worst design out there. It is heavy, it is thick. Very annoying to carry it in the pocket, and who wants to clip this thing on the belt or pants pocket? One hand opening and closing is doable, but awkward. Especially when your hand is cold and / or wet. Sheffield 1282 is highly regarded by one of the well known Youtube knife reviewer(look at the video above), but there’s nothing special about this utility knife. It is light, it is cheap. That’s all. Also, it is quite bulky. Stanley is not a bad utility knife. But, it is tad too big and heavy for my preference. And I really don’t like “folding” design on utility knives. GIL-TEC RUK in aluminum is light, really light. Also, sliding the blade out of this is the easiest of the bunch. But, that is all with this tool. You can’t use it as ply bar, even for really light duty plying job. My favorite is TPT. It’s thinner than GIL-TEC, it can be used for light duty plying, it can be used for tightening tripod screw etc, you can slide out / retract the blade with one hand. Also, take a look at the scond photo carefully. With TPT, you can pull the blade all the way out. But, you can’t do that with GIL-TEC. 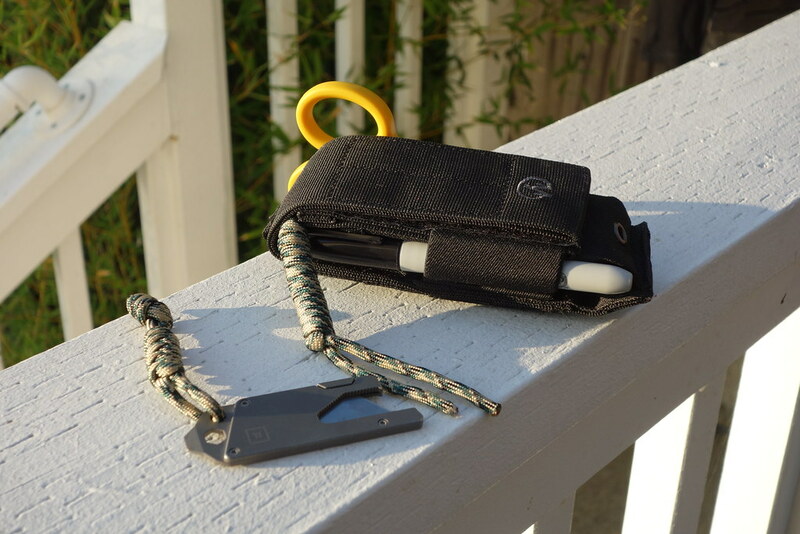 Putting paracord lanyard makes it easier to grab it in the pocket and pull out. The scissors, they are both excellent. I personally like OLFA better. Lighter, more comfortable to use. how do you carry them, really? You can’t put a pair of scissors in the pants pocket. 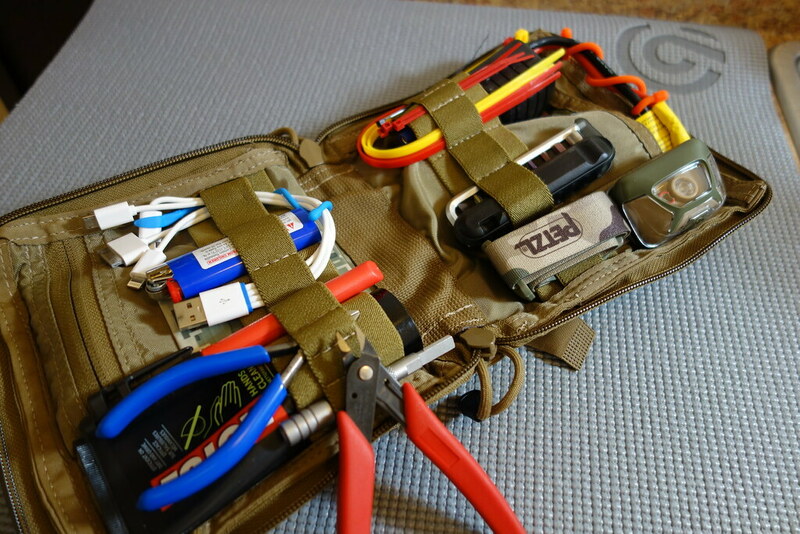 or keep them in your tool kit (box , bag, tool roll), or put them into small EDC organizer and make your own “grab-and-go” bag. 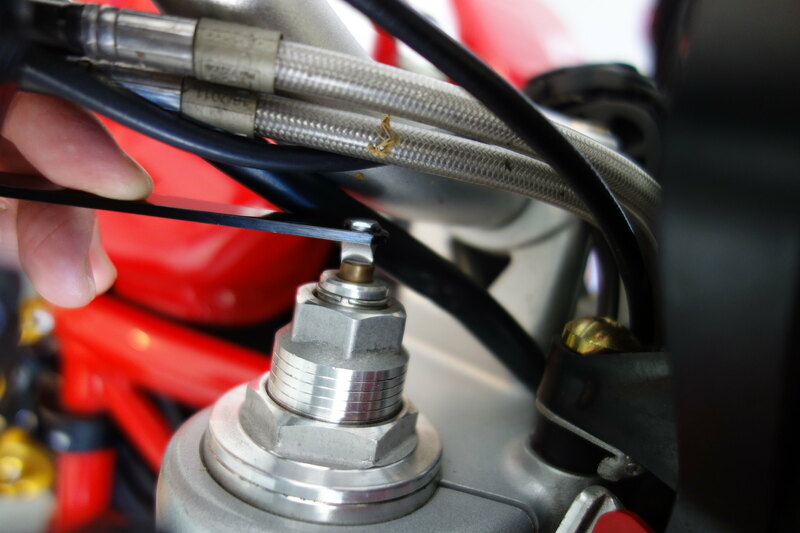 If you are a motorcyclist, you know that the zip-ties are god send. when you are out on the road, when you don’t have the right tool ? 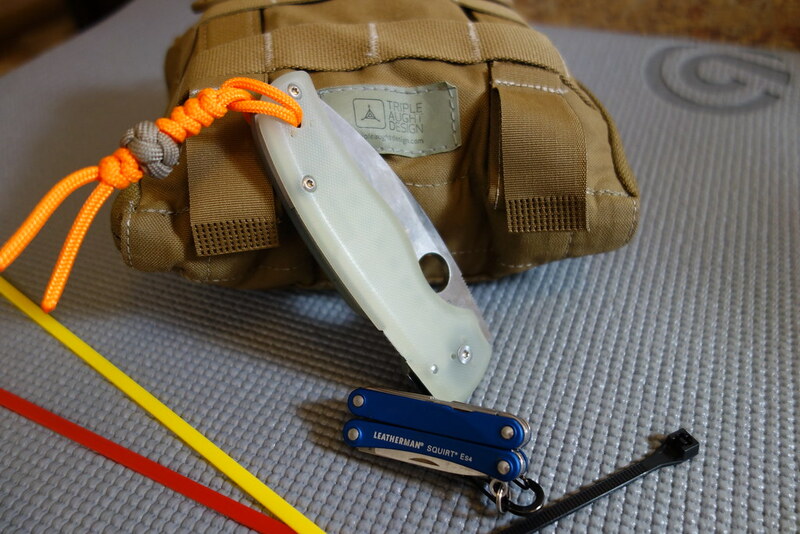 The video shows some examples of how to do it, with your EDC items. 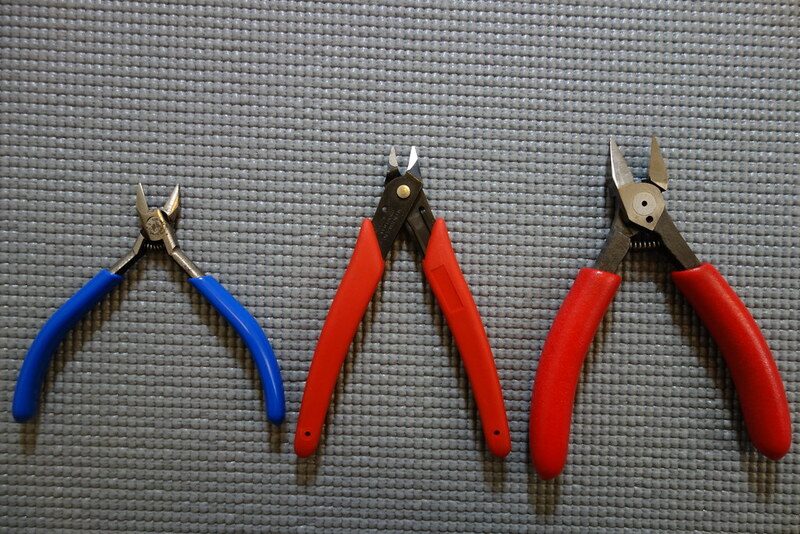 These are the right tools (flush cutter) for the job. But, most probably you wouldn’t carry this with you all the time, would you? (The smaller ones can be carried in a tool roll, or your “grab & go” bag . 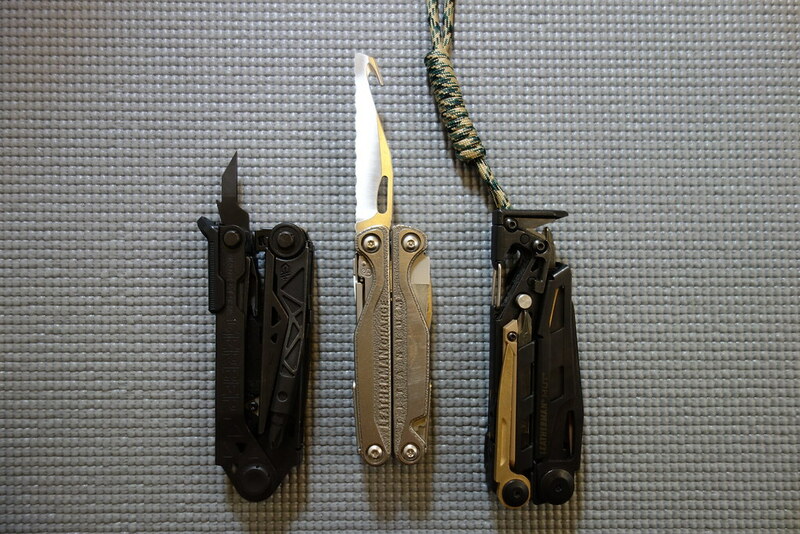 Squirt ES4 (or PS4), small nail clipper, and 3.5” blade folder, this set up you can carry as part of your EDC no problem. 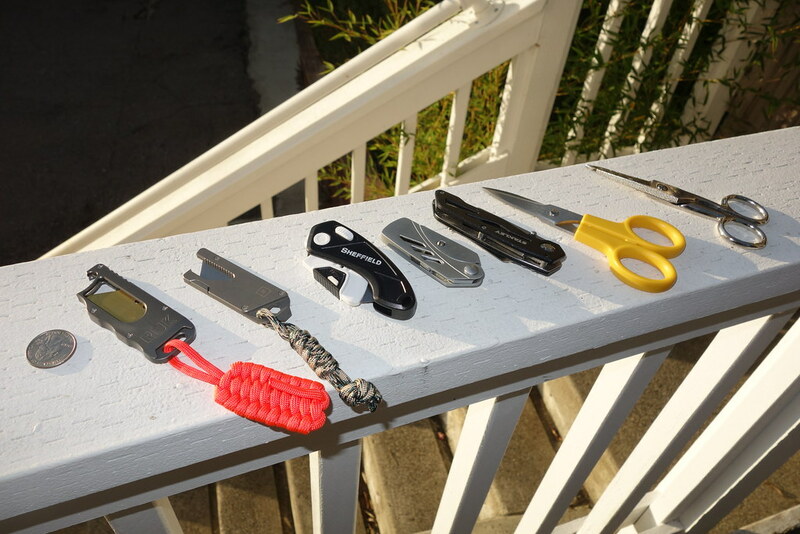 If you can live with carrying 8oz plus weight, some of the bigger multi tools are also nice to have.